Read first “How to successfully burn an ISO-image“. That site describes ways to burn iso files with different burning software, including the most common Nero Burning Rom. Most important is to remember that the iso file must be burned as a so-called IMAGE. If possible, it is even easier if you use the free program ImgBurn. When you insert a blank CD/DVD into your CD drive, you will immediately be asked if you want to burn an IMAGE. When you answered yes and selected the current ISO file to burn ImgBurn starts burning instantly. No special settings are needed. You can of course also use the excellent Linux programs K3b or Brasero for burning. They are as easy to use as ImgBurn. Before you burn your downloaded ISO file, make sure that it is error-free. You do this with the method md5sum. Read about this here. The program you need is called md5sum.exe. It can be downloaded directly here. You shall place md5sum.exe in C:\Windows\System32 before you can use the program. I should finally mention the following “obvious” things: A basic requirement for your burned disc to work is that you set the BIOS so that the computer can boot from the CD drive. This is done differently in different computers. The most common is to press the F2 or F9 key during start-up of the computer. That is, right away when you see the boot image coming up. So it looks like this on one of my computers when I’m inside the BIOS to change the boot order. If I want the computer in the first place to boot from my USB stick SanDisk Extreme I move it into position 1 by pressing F6. 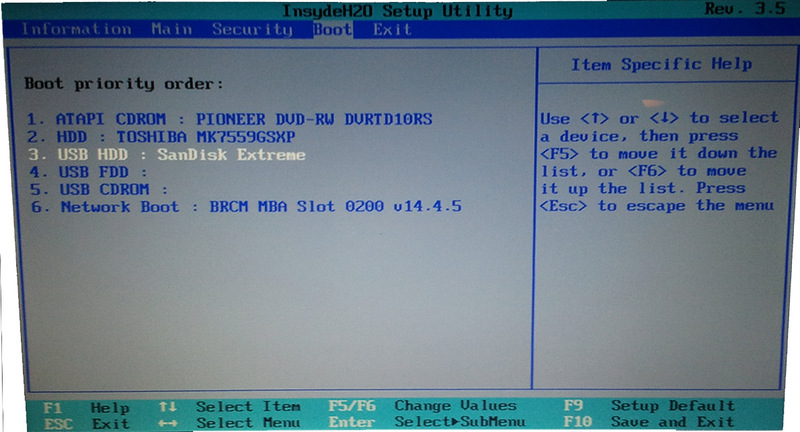 Then, I press F10 to save my changes to the BIOS. After that the computer restarts.